People ask me about pests and which ones I think are the worst. In a series of articles, I am listing my top 3. (See the first installment, here.) Number 2 is the lavra form of the five-spotted hawkmoth and closely related to the Tobacco Hornworm. The larvae of this species can be distinguished by their lateral markings: tomato hornworms have eight V-shaped markings and a red horn while tobacco hornworms have seven diagonal lines and a black horn. Both feed on tomato plants. Just the mention of their name is enough to send shudders down many a gardener's spine. In large numbers, the sound of them eating is very audible. Add to the fact that they blend in with the plant making detection of the actual worm hard. They can be quite sizeable as far as garden pests with some reaching 5 inches long. Lastly, they bite if provoked and excrete a green sticky goo that doesn't help. Start looking the plants over in late spring for eggs and the adult form of the worm. Their eggs hatch in a week. The larva will feed for 4-6 weeks before creating a cocoon which it will emerge as a moth the following spring. Luckily the damage these pests cause is obvious as stalks will be eaten bare - in fact smaller stalks could be completely eaten as well. The best way to find them is early morning or just after a rain when they will stand out more. Start at the top of the plant and work your way down checking under leaves and stalks. If you don't want to pull their heads off or smash them underfoot, drowning them in soapy water is a surefire method of killing them. Other ways to control or combat them is a small braconid wasp. These wasps lay eggs on the hornworms. If one has little white eggs that look like grains of rice let the hornworm be. It will soon be paralyzed and will shortly become food. 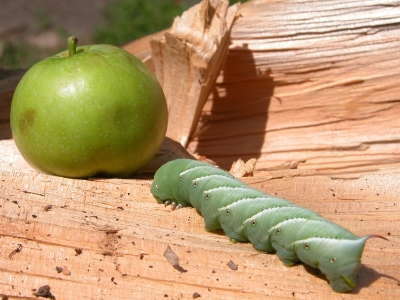 Common wasps also prey on the hornworm. Also making sure the ground is well tilled before planting is a good way to destroy the cocoons that are in the ground. Lastly, people have reported success with companion planting of dill and marigolds around the tomato plants. My pumpkin plants, once rapidly growing across my yard at an alarming rate, are sick and shriveling. After educating myself on the potential threat downy mildew posed to my impatiens, I have kept my eyes peeled for any symptoms to appear. However, the issue I have noticed is not with my impatiens, it is with my pumpkins. To my untrained eye, the phenomenon on my pumpkin leaves seemed like downy mildew. With some research, I learned that it is actually powdery mildew. Downy mildew makes its home on the underside of a leaf, powdery mildew appears on top. On the top of a plant infected with downy mildew, you will see yellowing. On a plant infected with powdery mildew, you will see white spots as well as some yellowing. Downy mildew prefers cooler temperatures, between sixty or seventy degrees Fahrenheit; powdery mildew does best when it is close to eighty degrees Fahrenheit. Powdery mildew does well with dry weather, while downy mildew needs damp conditions to thrive. Can I save my pumpkins? Prevention is much more effective than trying to battle the disease once is has progressed. It is advised infected plants should be disposed of properly. 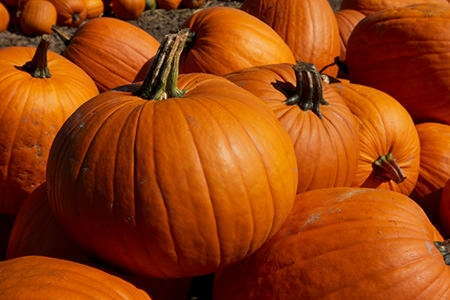 However, some people say that using different solutions in a spray bottle have helped rid pumpkin plants of this disease. One solution I keep seeing is simply milk and water. This seemed strange to me, since milk can get pretty disgusting once it has expired and especially if it is left in the heat. Many gardeners have had great success using a ratio of about 75% water to 25% milk. Do not use more than 30% milk, as this could promote the growth of other fungus. Research has shown that store bought milk is just as effective as raw milk. Why does milk help kill mildew? Scientists believe that the milk proteins combined with the sun's rays create an antiseptic that burns off just the mildew but does not damage the plant. Applying this solution once a week is good maintenance to prevent or attempt to treat plant disease. Another spray-able solution contains about a tablespoon of baking soda and two and a half tablespoons of horticultural oil for every gallon of water. Horticultural oil is a light-weight oil that is often used to protect plants from insect damage. This oil is usually vegetable or petroleum based and can be easily found online or in your local garden center. If you are in an area where drip irrigation is used and drought is common, then this method might not be for you because sodium bicarbonate (baking soda) can build up in the soil and deplete magnesium and calcium supplies, and can also block iron absorption. I suspect that the level of infection in my pumpkin patch is too severe for me remedy, so the best option I have is to get rid of the infected plant. Because mildew can spread to other plants, I need to make sure I do not discard the pumpkin vines near my garden or in my compost pile. Next season I will make sure to use preventative measures in hopes of avoiding the destruction of my beautiful pumpkin plants.